The scrum version of Agile has two very specific roles that you don’t see in other development environments: the Product Owner and the Scrum Master. Unlike other development methodologies, the development team members also have enlarged roles. Look at this illustration of which responsibilities lie exclusively with the Product Manager, which are shared according to preference and skill between the Product Owner and Product Manager, and which are specifically allocated to a Product Owner. Use this illustration to have a discussion within your own organization to clarify roles and responsibilities. In many teams the Product Manager is also the Product Owner. This situation leads to a huge workload and difficult-to-manage expectations because Product Managers should be spending a fair amount of time understanding customers’ needs by being outside of the office. And they need to be in the office as a Product Owner. 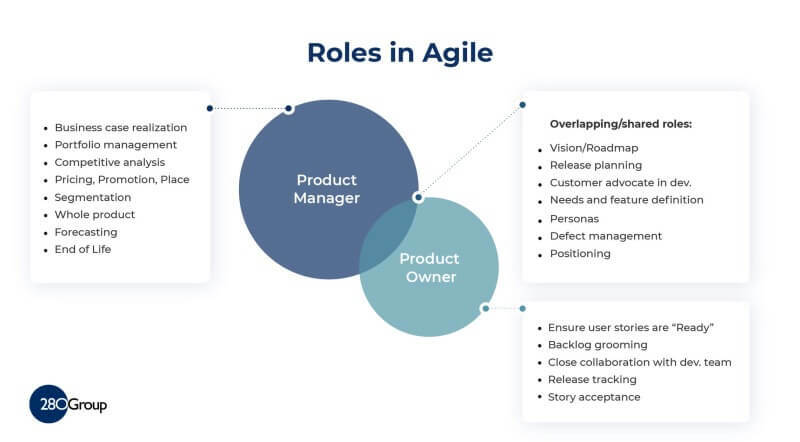 This inbound and outbound conflict of one person doing both roles is a conflict that continues to create great difficulty for Product Managers and Product Owners in Agile development organizations. The mission of the Product Owner is to represent the customer to the development team. A key activity is to manage and make visible the product backlog, or the prioritized list of requirements for future development. In fact, the Product Owner is the only person who can change the order of items in the product backlog. One unusual aspect of Product Owner responsibilities is that they must be available to the development team at all times to answer any questions team members have regarding the customer’s view of how they’re implementing a product feature. The Scrum Master role is to keep the development team working at the highest level of productivity. This person facilitates scrum rituals that drive the iterations with the scrum team and the Product Owner. They ensure that scrum processes and scrum-specified meetings are being followed and check progress against expectations. Critically, they act as a coach or facilitator for the team, helping team members solve problems and remove impediments to their progress. The Scrum Master can be a part time role or shared among multiple scrum teams, but under no circumstances should Scrum Master be a Product Owner. And finally, the people who make the product come to life: the developers. Whether they are called developers, engineers or R&D depends on company preference. Scrum specifies one thing: the team members are self-organizing. They decide amongst themselves who does which tasks and hold each other accountable. This change of accountability can be a stumbling block as the developers learn to organize their own work – and managers learn to let them get on with it. Scrum is a fascinating subject and making it work is an intricate dance with many possible moving parts. When it comes together, you can hear the music of understanding as you focus on the right topics for the right reasons and your product rises from this dance.